The escalating crisis between Iran and the United Kingdom over the detention of 15 British service personnel has aroused concern not just throughout the political and military worlds, but also for the Bus planners of London Transport. Transport for London uses GPS to locate its buses for amongst other reasons populating the electronic displays on stops that give the expected time of arrival of the next service. There have long been questions and complaints regarding the displays. Many a commuter has looked down from the sign saying their bus was due to find an empty road extending into distance. 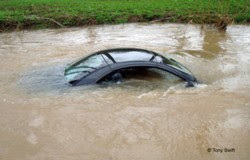 In related news Belinda Willis, who famously wrote off a £96k Mercedes in a river following the instructions of her satellite navigation system, said she felt vindicated by the crisis. WHICH BELINDA WILLIS WAS THAT WHO ENDED UP IN THE WATER? STILL INSIDE HER MERC.? IT SOUNDS AS THOUGH SHE SUSPENDED ALL HER COMMONSENSE, AS WELL AS HER CRITICAL FACULTIES !! DID HER INSURANCE CO. PAY UP ? ?